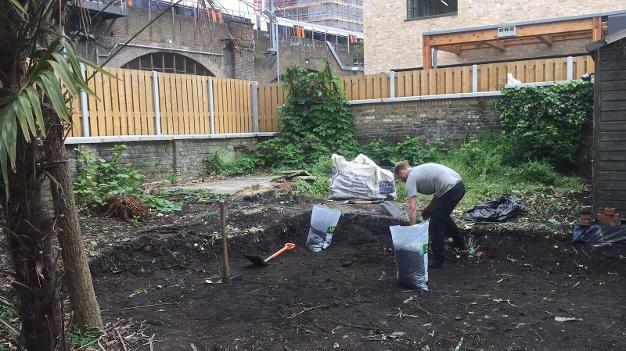 This gallery shows a selection of jobs that we have done across London. Please contact us if you'd like to know more about our services or to discuss your garden plans. Please contact us to find out more if you don't see what you're looking for below. Our gardeners and landscapers are here to help. The picture above shows the Landscaping work in progress as our team Diggs out and clears a long neglected area which was full of roots and rubble, full foundations were then laid before transforming the space into a beautiful two level Indian sandstone patio with step and shelf for sitting/planters. The patio completely rejuvenated the area and made it a perfect garden space for family barbecues and entertaining guests. The results can be seen in the image below. Diagonal brickwork patio to replace an existing patio. The pictures above show the progression of the job. 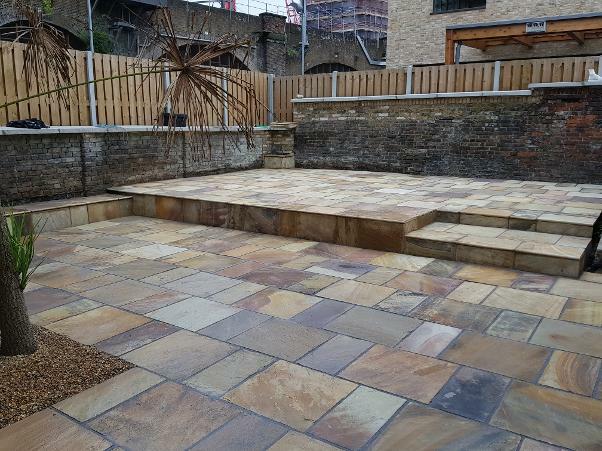 Dark grey granite style contemporary patio to replace rotten decked area in south east London. The pictures above show the progression of the job. Light stone patio and plant beds to replace overgrown completely paved garden. The pictures above show the progression of the job. Decking and seating area to replace existing old and rotting deck. The pictures above show the progression of the job. Raised deck showing build and finished product. Two examples showing decking before and after cleaning and treatment. The pictures above show a selection of the turfed lawns that we have laid for customers. A small selection of fencing projects recently completed by Londinium Gardens. The images above show a small selection of our landscaping and maintenance projects.